The Global Volcanism Program has no activity reports for Nevis Peak. The Global Volcanism Program has no Weekly Reports available for Nevis Peak. The Global Volcanism Program has no Bulletin Reports available for Nevis Peak. 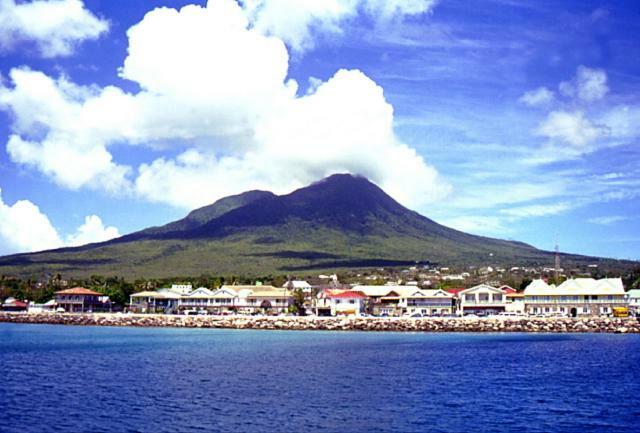 The conical island of Nevis, lying across a narrow channel from St. Kitts (St. Christopher) Island, is a composite cone with overlapping summit craters. An unnamed lava dome is located NE of the rims of the two craters. The high point of the island is located on the outer crater rim. The inner crater truncates the W rim of the earlier crater and is widely breached on the west side. A small lava dome was emplaced within the inner crater in recent pre-Columbian time, and pyroclastic flows and mudflows were deposited on the lower slopes of the cone. Four lava domes were constructed on the flanks: Madden's Mount (NE flank), Butlers Mountain (E flank), Mount Lily (NW coast), and Saddle mountain (S coast). No historical eruptions are known, and the youngest dated eruption was about 100,000 years ago. Active fumaroles and hot springs are found on the island (the most recent of these formed in 1953 and remains active), and seismic swarms have occurred on several occasions during the 20th century. Simpson K, 2005. Nevis. In: Lindsay J M, Robertson R E A, Shepherd J B, Ali S (eds). Volcanic Hazard Atlas of the Lesser Antilles, Trinidad and Tobago, Seismic Res Unit, Univ West Indies, p 169-178. The Global Volcanism Program is not aware of any Holocene eruptions from Nevis Peak. If this volcano has had large eruptions (VEI >= 4) prior to 10,000 years ago, information might be found on the Nevis Peak page in the LaMEVE (Large Magnitude Explosive Volcanic Eruptions) database, a part of the Volcano Global Risk Identification and Analysis Project (VOGRIPA). There is no Deformation History data available for Nevis Peak. There is no Emissions History data available for Nevis Peak. Nevis Peak volcano is seen from a ferry approaching the port of Charlestown, which lies across a narrow channel from St. Kitts Island. The composite cone is capped by two overlapping summit craters that are partially filled by a lava dome. Four other lava domes were constructed on the flanks of the volcano. A small lava dome was emplaced within the inner crater in recent precolumbian time, and pyroclastic flows and mudflows were deposited on the lower slopes of the cone. Photo by Kirstie Simpson, 2001 (Seismic Research Unit, University of West Indies). The Global Volcanism Program has no maps available for Nevis Peak. There are no samples for Nevis Peak in the Smithsonian's NMNH Department of Mineral Sciences Rock and Ore collection. Large Eruptions of Nevis Peak Information about large Quaternary eruptions (VEI >= 4) is cataloged in the Large Magnitude Explosive Volcanic Eruptions (LaMEVE) database of the Volcano Global Risk Identification and Analysis Project (VOGRIPA).